The bear is smaller than I expected but I loved it. Celebrate your new grad and their graduating class with this plush teddy bear keepsake! 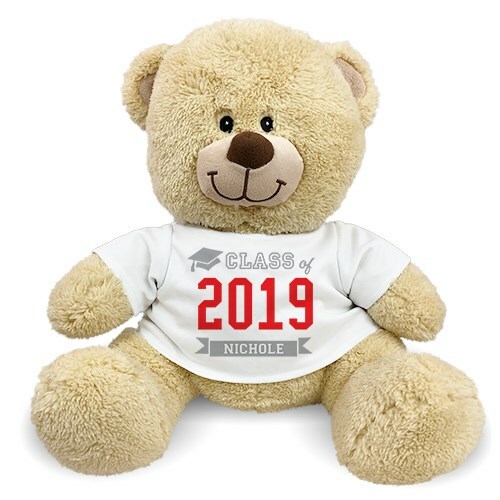 This stuffed graduation bear may be personalized with any year, displayed in one of our popular school colors along with any name, printed underneath. This Class Of design is printed on our Sherman Teddy Bear. Sherman has an irresistible look on his face along with a wonderfully soft feel. He features contrasting tan fur on the inside of his ears and his snout. He's available in sizes 11”, 17" & 21" sitting, and makes a wonderful gift for any occasion. Free gift wrapping and free personalization of any name and year is included. A great graduation gift idea for grads of all ages. Additional Details Find more cute ways to celebrate your recent grad's accomplishments over at our Graduation category. Check out great items like this plush bear holding a picture frame!